The D-FA 100mm f2.8 WR Macro is one of the newer mid-range lenses from Pentax, which was based on a long line of 100mm macro lenses through the years. The main purpose of a lens like this is to have the ability to achieve 1:1 magnification of the subject, but also allow for a good amount of working distance from the subject thanks to the 100mm focal length. Macro lenses generally have the best sharpness characteristics out of all lens types, but the reason all lenses are not macro lenses is that a long amount of lens element travel and fine focus ring rotation is necessary to achieve that level of magnification and sharpness. Having a quick standard lens trades some of that ability for practicality. As the SMCP-D-FA 100mm F2.8 lens is still available new, I’ll first go over the differences between the two lenses. The SMCP-D-FA lens has an aperture ring, so you can change the aperture by hand allowing it to work in older camera bodies that don’t have the ability to change aperture. The D-FA WR on the other hand has weather resistance, aluminum casing, aluminum focus ring, and curved aperture blades. Both lenses are optically very similar or the same. The D-FA WR lens is a respectably compact lens that you can hold in one hand easily. It is a full frame lens that will work on full frame Pentax film cameras that can control aperture (Pentax does not currently offer full frame digital SLRs). 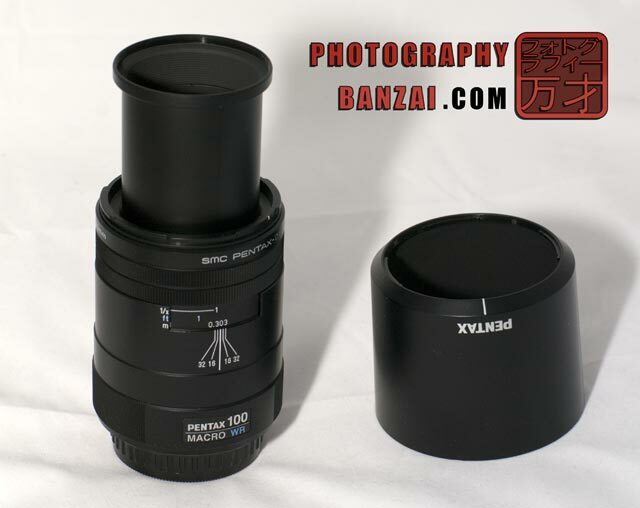 With the new aluminum casing, it is a very nice looking lens with that special Pentax limited lens feel. The hood connector and interior lens barrel are black plastic and most likely directly carried over from the older design with presumably some improvements in weather resistance between the two components. The lens name and serial number are engraved into the aluminum manual focus ring in a similar fashion to the DA* high end lenses. The manual focus ring takes around 5 hand rotations for me from end to end, with a nice solid feel as the interior barrel extends (meaning there is gasket material providing some extra resistance). 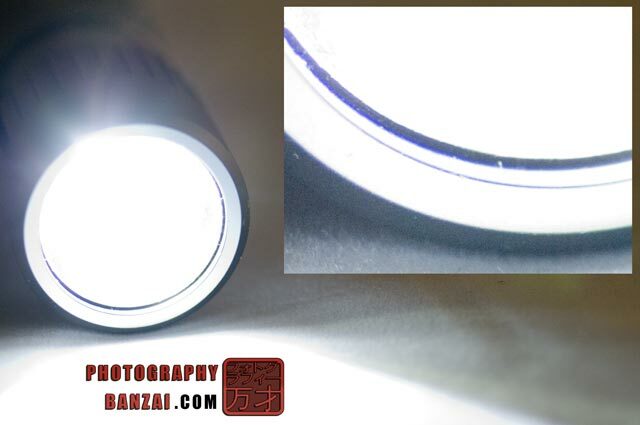 The manual focus ring does rotate when the lens is in auto focus mode. In auto focus mode the lens is relatively slow on my K-7 because there is such a large amount of travel necessary from end to end. Noise when auto focusing is not quiet or short if you are on the other end of the focus range, but that’s just a standard property of screw-drive focus with a macro lens. – Full frame lens (the FA specifier in DFA). Even with only APS-C available, it gives those cameras the “sweet spot” effect. – Extremely good background blur (bokeh). – Very nice contrast-y color rendering. 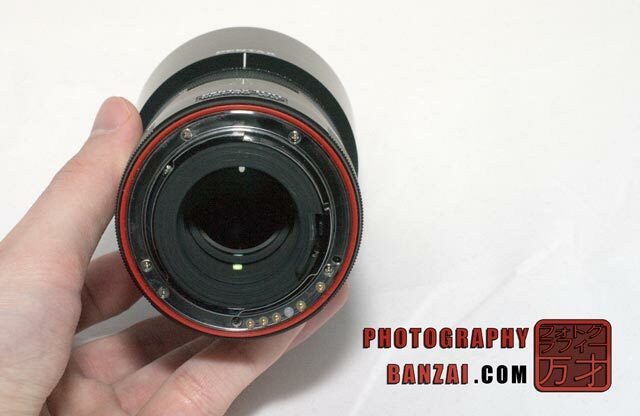 – Solid aluminum casing and focus ring. – Image quality is still good with a decent teleconverter. – Quality related aspects of a DA* or Limited without a premium price (casing, lens details and serial number on the focus ring, solid feel). – Aperture of f2.8 is nice to have. – Images are nice and bright through the whole frame even at f2.8. – The interior barrel and hood mount are plastic, but it’s a welcome trade-off for a lower price. – The interior barrel extends a lot. I’m just not personally fond of lenses that have any type of extending barrel because it won’t ever be as water resistant as ones that don’t. However it’s really unlikely a lens like this would be made that doesn’t have an extending barrel due to the large amount of travel the front lens element makes (fully extended, the lens is almost twice as long). – Chromatic aberrations, specifically purple/green fringing, is visible in extreme lighting conditions. I think Pentax really needs to release more D-FA WR lenses. 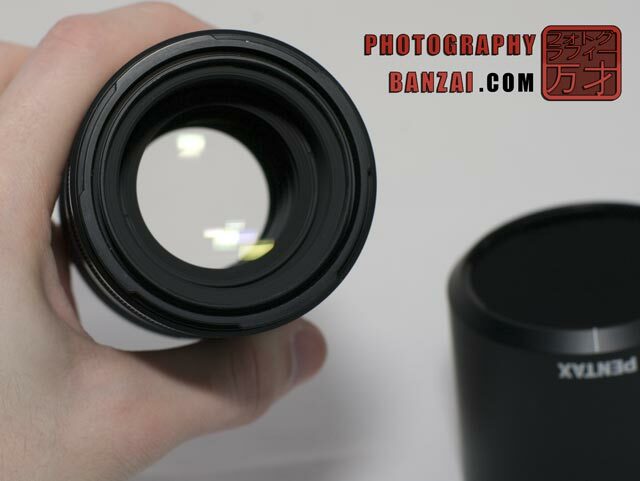 This lens is an excellent combination of performance, build quality, and price. It also is a future relevant lens as it can support a full frame 35mm imaging sensor (assuming Pentax eventually joins the FF party someday). This lens is well worth the price of admission, which as of this review is around $610 from popular online retailers such as B&H and Adorama. It’s a very versatile lens and can be used for pretty much anything such as it’s intended macro purposes to portraiture and event photography. Just keep in mind focusing speed with macro lenses in general isn’t the fastest or is screw-drive focusing the quietest out there. This entry was posted in Lens, Reviews and tagged 100mm, dfa, excellent, f2.8, macro, pentax. Bookmark the permalink.